Given how critical this spec is to choosing the right projector for the image size you want, it can be helpful to know a little more about it. This is especially true because there are several ways to measure lumens, so two projectors with the same lumen rating aren't necessarily equally bright. One minor issue is that even though most people, including us, talk about lumens as a measure of brightness, it actually isn't. Technically speaking, brightness is strictly a matter of perception, so talking about how bright something is really refers to how bright it looks. Lumens are actually a measure of illuminance, which refers to the intensity of light coming out of the projector. Even if you never use the technically accurate definitions, the difference between the two is important to keep in mind, because when you measure lumens—the illuminance of a projector—you're not measuring the brightness of the image. However far you put a projector from a screen, it will (with any given settings) offer the same illuminance. But at closer distances, the illuminance will be spread out over smaller areas, so the image will be brighter. That said, we'll largely ignore this technical distinction between illuminance and brightness for the rest of this article and use the less precise, but more common, definition for brightness to include illuminance. Beyond this semantic issue, there are several distinctly different approaches to measuring lumens. 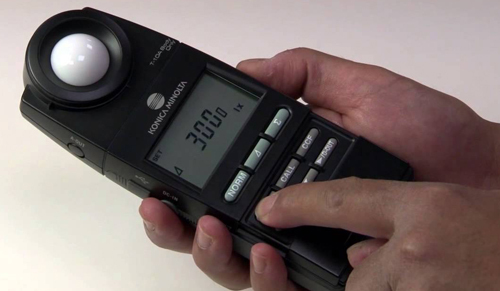 All involve taking a measurement or measurements with a light meter and calculating brightness in lumens based on the readings and the area of the image. We'll start with ANSI lumens, which is the most common approach, and the primary one we report in our reviews. Measuring ANSI lumens—a procedure developed by the American National Standards Institute (ANSI)—requires measuring nine specific points in a 100% white image and using the average of all nine to calculate brightness. 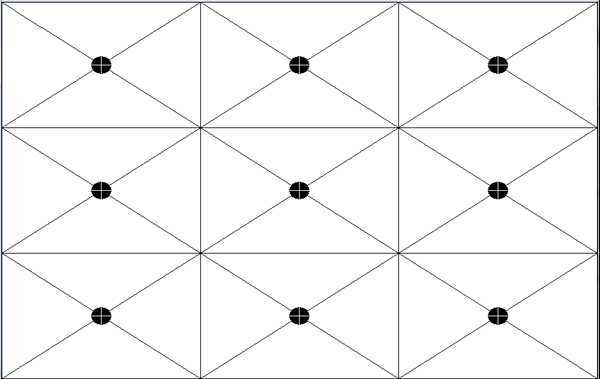 If you picture a tic-tac-toe grid covering the entire image, with evenly spaced columns and rows, the nine measurement points would be at the center of each rectangle in the grid, as indicated by the black dots in the image below. Measuring ANSI lumens involves taking measurements at each of the nine points indicated by the large black dots shown here. To get an accurate measurement, the projector should be the only source of light in the room, and there shouldn't be any reflective surfaces in the room—including light-colored walls—that would add to the light coming directly through the lens. Since the goal is to measure the projector's lumen output rather than how much light is reflected from the screen—which may not be the same—you need to hold the meter with its back flat against the screen, and the sensor facing toward the projector. 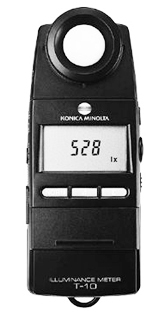 The meter itself (an example is shown at right) is called an illuminance meter. It measures in units of Lux, which is defined as the lumens per unit area. Why Measure Lumens in Different Color Modes? Most projector spec sheets, and even many reviews, give a single value for ANSI lumens, stating the projector's highest brightness level. Although this tells you the maximum illumination, it is often not the most useful information to have, since it may require choosing settings that don't optimize the image in the manner you'd prefer. For many projectors, for example, the color mode with the highest brightness effectively throws out any attempt at producing accurate color, so the high brightness comes at the cost of an obvious, usually green, bias. And even projectors that offer acceptable color accuracy at their highest brightness may deliver better accuracy or otherwise improved image quality with a different color mode. Keep in mind also that manufacturers tune the factory default settings for each color mode for different purposes, as often indicated by labels such as Film, Video, Photo, and Presentation. Even when the names don't match the type of images they work best with, some color modes usually work better than others for particular types of images. Since different color modes can have vastly different brightness levels, we measure and report ANSI lumens for each one, both in full power mode for the light source and with any Eco mode the projector offers. And because a projector with a zoom lens of 1.3x or higher can deliver significantly lower brightness at the full telephoto end of the lens than at the full wide angle setting, we also measure and report how much light is curtailed at the full telephoto end. In any of these cases, knowing the brightness you'll get with the settings you want is more useful than knowing the brightest level the projector can deliver. Also, with some projectors the brightest level may be too bright for your combination of screen size, screen gain, and ambient light level. In those situations, it is helpful to know the range of brightness available, to confirm whether you can easily match the projector's brightness to your needs. There's an important complicating factor about projector brightness that you also need to be aware of: Although ANSI lumens are often referred to simply as lumens, not all lumen measurements are ANSI lumens, and the alternatives are also often referred to simply as lumens. So when comparing lumen measurements or specs, you need to be sure you're comparing numbers that are actually comparable. Two key variations are center spot lumens and LED lumens. Center spot lumens: If brightness is listed as lumens rather than ANSI lumens, the manufacturer may be using a center spot reading only. The procedure for measuring center spot lumens is almost identical to the one for ANSI lumens, except that you only measure the one spot at the center of the center rectangle in the tic-tac-toe grid. This almost always gives a higher measurement than ANSI lumens, because no projector delivers uniform brightness across the entire image, and the center point is usually one of the brighter points of the nine defined for ANSI lumens. If we know that a particular vendor uses only the center spot in its rating, we typically report our measurement of center spot lumens along with ANSI lumens, particularly if the projector has a significantly higher lumen rating than the ANSI lumen measurement. LED lumens: Some manufacturers rate brightness for LED and laser projectors the same way as for lamp-based models. Others argue that people perceive the images produced by LEDs and lasers as brighter than a lamp-based projector with the same illuminance measurements, and they give the rating in LED lumens or add a note that the rating is based on lamp-based models with the same perceived brightness. We discuss this issue in individual reviews when appropriate, typically when the LED lumen rating is much higher than our measured ANSI lumens. For more details on this issue, see Are LED Lumens a Real Thing? Color Brightness, aka Color Light Output (CLO): Color brightness, or CLO, is a complicated issue that we discussed in ANSI Lumens vs. Color Light Output. The procedure for measuring it is similar to the one for measuring ANSI lumens, except that it uses color images. As a general rule, color brightness and white brightness match with 3LCD projectors, but not with DLP projectors. Color brightness measurements are taken the same way as ANSI lumen measurements, but with color rectangles that each use one of the three primary colors—red, green, and blue. Lux measurements are taken at the center points of each rectangle on each of the three test images shown above. For each matching position in the tic-tac-toe grid, the red, green, and blue readings are then added together to give the R+B+G total for that point. The average of the nine R+B+G totals is converted into color lumens using the same formula as for converting readings on a white image to ANSI lumens. Maximizing white brightness gives DLP projectors a brightness boost for some kinds of images, including word processing documents, for example. But if there's a large enough difference between the white and color brightness levels, color content—as you get with most movies—will be noticeably dimmer than you would expect from a 3LCD projector with the same ANSI lumen measurement. When testing DLP projectors, we also measure color brightness, and mention the results in reviews as appropriate. This list of other kinds of lumen measurements isn't meant to be exhaustive, but it covers the most common variations. The theme that runs through it is simple, however. What you should always remember is that there's more than one way to measure lumens, the different approaches give different results, and where the results differ significantly from the ANSI lumens we measure, we generally explain why. Perhaps most important is that you can always count on consistency from ProjectorCentral: Since we follow the same methodology and measure ANSI lumens in every case, our results are fully comparable from one projector to the next.